Remodeled masterpiece on canyon view lot! This stunning, single level home features a great room with canyon views, vaulted ceilings, gourmet kitchen, new refrigerator and dishwasher, and island with breakfast bar. The master suite offers canyon views, remodeled master bathroom, contemporary counters, and tile-surround shower. The pool-sized backyard offers two decks and room for boat/RV storage. Close to stores, restaurants, beach, schools, community park, and skate park. THIS IS A MUST SEE!, Gorgeous, contemporary masterpiece, on canyon view lot, remodeled with impeccable taste! This stunning, single level home features a floor plan with a great room effect where the kitchen flows into the dining area and family room with views of the canyon, dramatic vaulted ceiling, cozy fireplace with modern concrete mantle and raised hearth, and designer ceiling fan. The gourmet, chef's kitchen offers modern concrete counter tops with designer tile backsplash, stainless steel appliances, brand new refrigerator and dishwasher, hanging pot rack, and island with inviting breakfast bar. The luxurious master suite offers sliding doors with beautiful canyon view, three closets allow for ample storage and fully remodeled master bathroom with modern sink, contemporary concrete counters, and designer tile surround shower. The guest bedrooms feature new plush carpeting and designer paint, and the guest bathroom has been fully remodeled to include a modern vanity and designer tile surround shower. The extra-large pool size backyard with gorgeous canyon views is an entertainer's delight with space for a garden, two outdoor decks for relaxing with family or friends, two storage sheds to hold your tools or toys, and access to hiking trails. Other magnificent features of this home include outdoor side area large enough for boat or RV storage, rustic wood laminate flooring throughout, light and bright with many windows, large single car garage with room for storage, no HOA or Mello Roos, and brand new window treatments throughout. 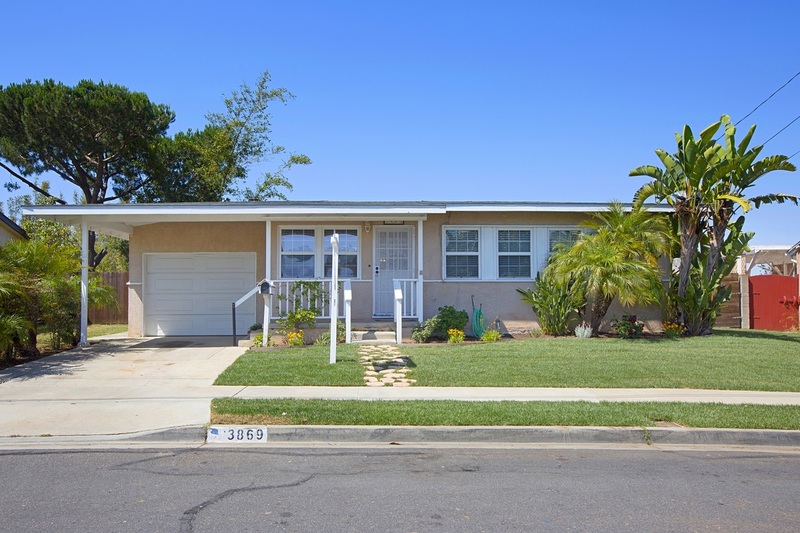 Excellent location - close to many brand-new stores and restaurants, schools, South Clairemont Community Park, YMCA pool, YMCA skate park, and just a short drive to the beach. THIS IS A MUST SEE! SEE ATTACHED LIST FOR COMPREHENSIVE LIST OF HIGHLIGHTS AND UPGRADES.